Holly Haines Asks, Will it Pretzel? 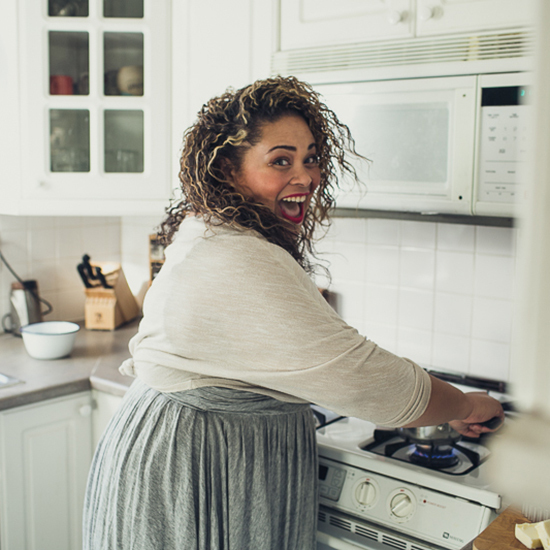 The comfort food–obsessed Holly Haines of From My Impossibly Tiny Kitchen talks about her small kitchen tricks and her obsession with pretzeled baked goods. The Blog: Comfort food–loving Holly H turned a hashtag (#fmitk) into a sassy blog, From My Impossibly Tiny Kitchen. What are some fun tricks you’ve learned from cooking in a tiny kitchen? My over-the-sink cutting board adds much needed “counter top” space and is probably in my top five tiny kitchen must-haves. Not so much a trick as much as it’s a necessity: Constantly staying organized while cooking is so important in a tiny space, especially a tiny kitchen without a dishwasher. Do all of your prep work before actually cooking—mise en place (putting everything in place)! As common sense as it sounds, clean as you go; put things like spices back in their designated homes immediately after using them. It’s easy to get into the groove of cooking and forget to stay organized and clean in the midst of it all. Clutter is the devil in a tiny kitchen. I also make sure to purchase cookware items that can be stacked and nested easily—collapsible colanders, stackable pinch bowls, etc. Everything has to stack vertically in this tiny kitchen. Finally, baker’s racks are a tiny kitchen’s best friend. My kitchen has actually crept into my living room at this point—I’ve moved all of my everyday-use items (plates, bowls, eating utensils) over to baker’s racks adjacent to my kitchen area where they’re easily accessible. This helps to free up my limited cabinet space for items that I need readily available while cooking—like my ridiculous hoard of spices. Placing magnetic strips along empty wall space or the side of your refrigerator for utensil and knife storage is also great way to free up drawer space. What is the most impressive meal you’ve created in the kitchen? First place for most impressive meal goes to a dinner party I planned for my best friend and his co-workers, also known as the “Make Us a Five-Course Menu of your Favorite Things for 12 People…Oh, Wait, Some People are Vegetarian and Allergic to Most of Your Favorite Things” dinner party. Although I was initially intimidated by the thought of creating a delicious vegetarian-friendly menu that would also satisfy carnivores, I welcomed the challenge with open arms. It also gave me an excuse to make lots of homemade cheese and pasta. You can get all of the Iron Chef challenge–like details here. The Pretzky bun—you said if there’s one recipe that will make you famous, it’s this one. Has it? What kind of response has it had? My Pretzky-garnered fame hasn’t come as of yet, but the Pinterest and Facebook foodie communities seem to love them! I recently had the pleasure of being a completely awkward fangirl and speaking with Susan Feniger at Mud Hen Tavern one evening. I told her about my Pretzky bun technique and how I think she could incorporate it with some of the flavors featured on her dessert menu, and she asked for the recipe! So, if you find something similar to the Pretzky bun in her next cookbook, you’ll know where it originated. You also said that you would pretzel everything if you could. What else have you “pretzeled” or what else do you want to pretzel? So far, I’ve pretzeled Pretzel Rolls, pizza buns stuffed with cheese, chicken and vodka sauce, and mushroom and quinoa pot stickers—a recipe adapted from Dale Talde of Top Chef. I have a fantasy of pretzeled Belgian waffle, but the logistics of poaching waffle batter are currently baffling me. Other pretzel fantasies include a pretzel macaron, pretzeled puff pastry filled with chocolate pastry cream (like pain au chocolat and a pretzel had a baby!) a pretzel whoopie pie, and a pretzel ice cream sandwich with a malted milk ice cream. Doesn’t that sound glorious? I’ve also made it my life’s goal to master the Philly soft pretzel: I’ve tried three times and I still can’t quite get the texture right. What food bloggers are you newly obsessed with right now? I am a food blog for photography and plating inspiration. Kitchen Konfidence: I love layering unexpected flavors, and Brandon’s blog has inspired me to try to create more infused oils and liquors to incorporate into my recipes. The Beeroness: I work with a local brewery here in San Diego and I get a lot of inspiration from Jackie’s food and beer pairings. Whisk & Knife: This husband-and-wife team showcases unique flavor combinations, and FMITK just loves comfort food with a twist!